In recent years, the kitchen has moved steadily towards first place in design importance. Functional and simple kitchens once satisfied most homeowners, but now this room is often used for entertaining guests and, with that, its design has become more important. This holds true in Southwestern style homes as well, so I always make sure to combine vibrant colors and interesting decorative features to create a welcoming atmosphere. 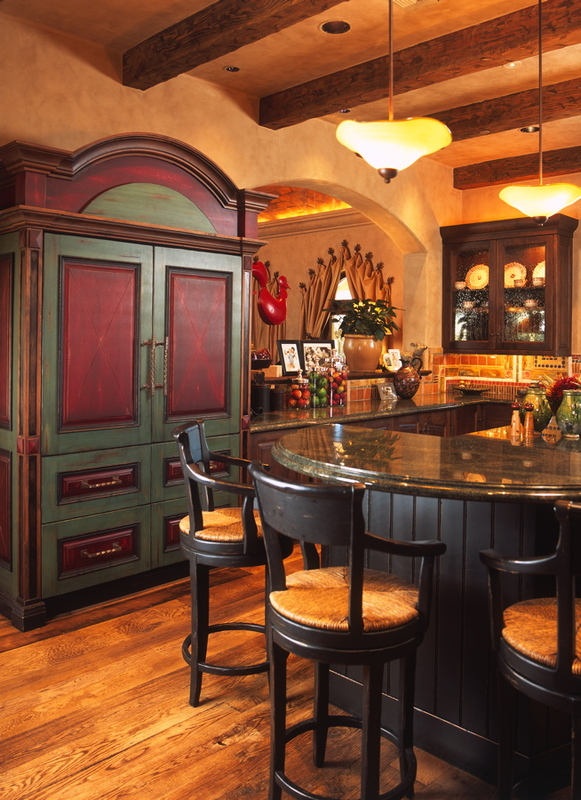 Warm, lively colors work very well for kitchens and are said to stimulate the appetite. The southwestern palette is fortunately rich in vibrant colors, so we put it to great use in this kitchen design I created in Mexico. The colorful tile backsplash provides the design focal point. The tiles’ bright gold, orange and yellow ochre, soft desert rose and cactus green provide the cheery elements needed against the backdrop of dark wood, neutral walls and a rustic range hood. Wood stools match the island while the woven seats add textural appeal. Natural southwestern flora, displayed peppers and other regional edibles lend this design an inviting, organic appeal. At this angle, you can get a better look at the wood beams on the kitchen’s ceiling, which immediately adds a rustic charm to the space. For the countertop, we used the same material as the island top and extended colorful tiles along the walls. Both of these design elements work to facilitate visual cohesion in the room. Adjacent to the counter, a rustic refrigerator armoire in green and red brings in a touch of class and sophistication. This adds interest and character to the space, but we kept the hues subdued so they wouldn’t compete with the colored tiles. Red and green fruit, stored in clear glass containers, cheerfully connect with the armoire’s colors, as do the carefully selected green pottery and a bowl full of red edibles positioned on the island just opposite the fruit. The effect as a whole is both vibrant and inviting! 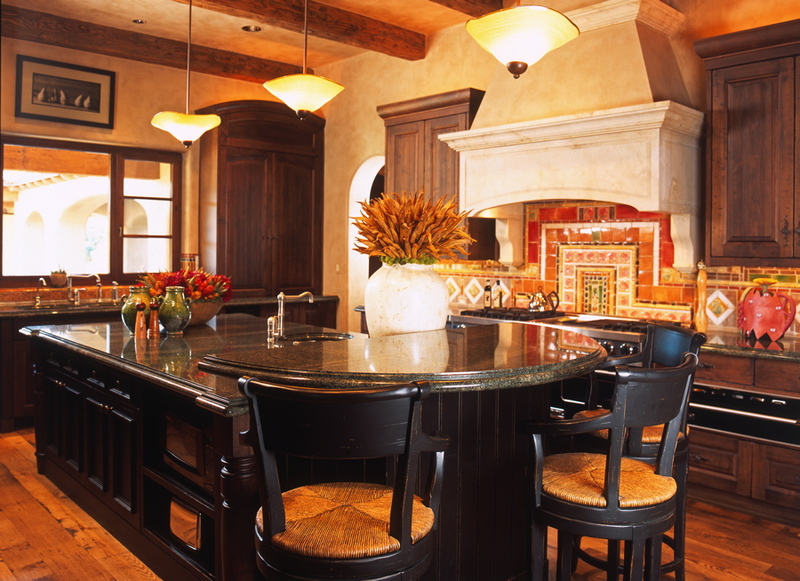 When your kitchen needs a new, uplifting Southwestern style, we can help you achieve your dream design. 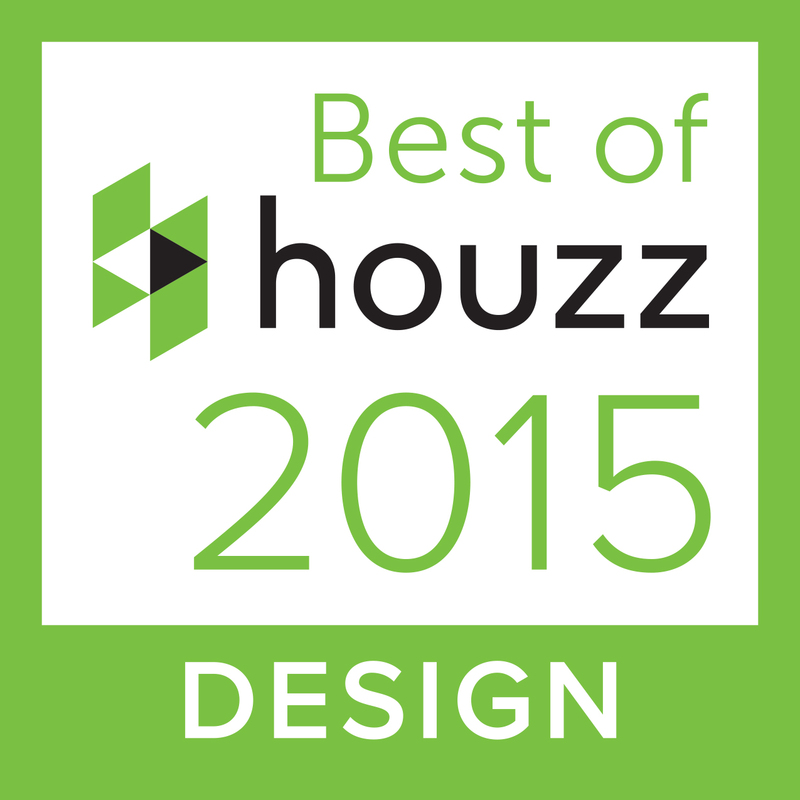 Contact us today at Paula Berg Design Associates to learn more about our design services.